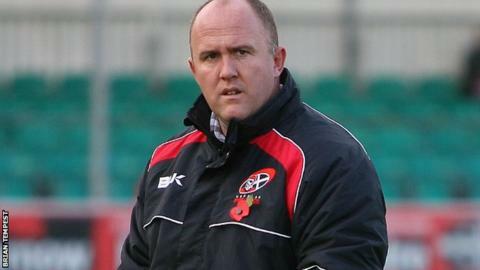 Cornish Pirates boss Ian Davies says he and his coaching team are the right people to get the club out of their current difficulties. The Penzance-based club have slipped to bottom place in the Championship having lost seven of their opening nine games. "We know we're not where we need to be, but we're the people that can get us out of it," he told BBC Radio Cornwall. "The boys are working really hard, myself, Gavin and Paves have put in a lot of hours and a lot of planning." Davies has been in charge at the Mennaye since April 2012, having served as forwards coach since April 2009. "We'd like to get some wins sooner rather than later, but at the same time we don't think we're a million miles away from it," added Davies. "We're just far enough away to not be picking up those wins at the moment." Davies says he will give his younger players the chance to impress in the British and Irish Cup over the next two weeks, after a disappointing showing from his more established squad members. "We're missing those 26 to 30-year-old players, the guys that have played 80, 90, 100 Championship games - those are the ones that cost you the money. We haven't got those," he added. "We've got guys who are 30-plus and guys who are under the age of 24. "Those under 24 are going to get their chance in the next few weeks to show us what they've got, because the guys who are in the older age bracket haven't performed as well as we would have liked, so we'll have to look at other options."